...yay! Only 24 more days!! Although, we had our biggest snow of the year in early March last year...but anything is possible...and the Farmer's Almanac is predicting a "blizzard" before Spring officially arrives...we'll see! But being cooped up inside has certainly sparked my creativity these last couple of weeks. 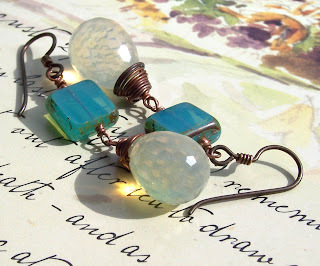 Here are a few of the new things I've made: "Lemondrops & Lollipops" ~ gorgeous Turquoise Aqua Glass & Yellow Opalite Briolette earrings. "The Wind & The Willow" ~ I love this hand-etched Tree pendant...matched up with Turquoise Stones & Faceted Aqua Blue/Green Czech Glass beads. 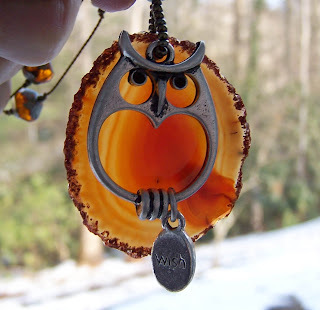 And last, but certainly not least...my favorite of all: "Word to the wise" [pick your word] ~ A gorgeous slab of Agate, adorned with a beautiful little Pewter Owl and a "wise word" pebble. So I've been thinking about a "sale" and I'm going to have an "Ides of March/Spring Ahead" sale starting March 15th [the Ides of March] and ending at midnight March 20th [the 1st day of Spring]. It will be a 15% off your total purchase sale [including shipping]. So be on the lookout for my newsletter on March 14th. 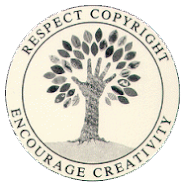 If you're not on my mailing list, you can sign up through the link in the right column of my blog. Of course, if you just can't wait that long, for all of my special little blog readers, type in "Spring" in the comments to seller section and I'll give you the 15% off discount starting today [discount will be refunded through PayPal, after you checkout]. lastly...I have to share this awesome picture! It was really nice out day before yesterday, so Wayne and I took an afternoon drive. This farm is down the road from us and it was just gorgeous. 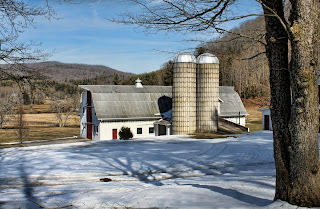 I loved how the snow was slightly melted, the sky was bright blue and the red doors on the barn just made it all "pop". I hope you enjoy it. Welp...more snow is predicted for today...which means...more jewelry to make!!! 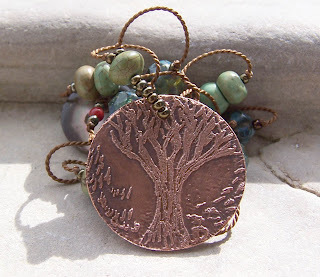 Love the Wind in the Willows necklace and marked as a favorite the other day. 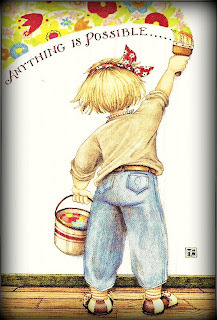 Can't wait for spring - another storm is hitting us again tomorrow! Thanks ya'll!! Beth, did you get your earrings? I hope you love them!! !